As a refresher; this is my trek to recreate a non cable, alternative TV solution to replace the $100 a month cable habit. Admittedly, I take a bit longer than your average media reviewer to make a decision or evaluate something. As I mentioned back in Part IV.I, one of the hooks with the Cable TV option is the (relatively) seamless use of cable box provided remote control and access to programing. As mentioned, the solution I have been creating is a bit more complex. To achieve a similar viewing experience, you need an antenna, an internet connection, a separate DVR, and maybe a DVD player. While building this solution, I have been collecting additional remote controls and as of this moment I am up to 7 for one TV. My current solution is fairly complex. 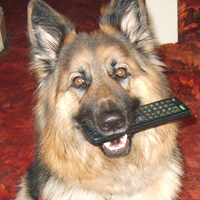 It may require 2 to 3 different remotes to switch between the various sources. If my wife wont accept the procedures required to get to the various sources, she will push back. 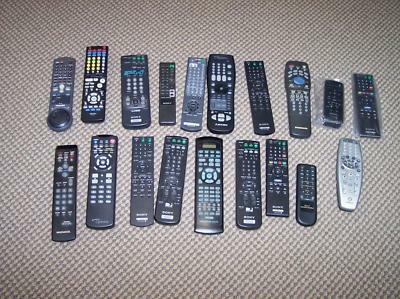 Universal Remotes: These all in one controllers have been around nearly as long as multiple remotes. I have to admit, being cheap, I never considered any of them good enough to justify the expense. However, it was worth some research to see where the technology currently is. The good news is, there have been dramatic strides in this category of electronic devices and by most sources, the Logitech brand is viewed as the bench mark product by many professional equipment reviewers. Looking at the Logitech family of remotes (at least 3 to choose from), they all function the same way but the 650 model only supports 5 devices and the 900 supports 15. In the middle is the Harmony One. The major differences with the more expensive 900 is the RF control. The Harmony One is very similar to the Model 600, but will control 15 vs. 5 remotes. Do you need the RF version? What is RF vs IR. IR (InferRed Light) devices require line-of-sight to see all the devices vs. RF (radio frequency) that can transmit through walls. So, if you have all your equipment in a cabinet or closet, the RF device will project through the wall (granted you will still require a device to convert the RF to IR to talk to all the equipment since IR is the most common communications path for residential grade AV equipment. The Harmony One appeared to be the best choice for me since I already had an IR pipe to my equipment closet and I needed to control more than 5 devices. The tactical buttons to move around the devices (DVR, DVD, Cable Box) are pretty common. Such as; forward, back, up down, fast forward etc. So, no mater what device you are using, those common command buttons remain the same. Device specific command are through a touch screen that allows you to access specific buttons to further customize your request. (i.e. choose a CD track or access specific segments of a DVD). These commands are not near as regularly used as the ones mentioned above. Activity based commands: This is the icing on the cake. With programing, you set one button to perform multiple functions on multiple devices. For instance; to watch a DVD with my system this is what happens: TV=On, TV=Video 1, DVD=On, DVD=Play, A/V Reciever=On, A/V receiver= Video 1. That is 6 commands over 3 different components with ONE BUTTON. This is AWESOME… MY WIFE CAN DO THIS!!!!!! SHE DID THIS BEFORE I SHOWED HER HOW!!!!!! The downside: I got excited in the last bullet point, so as you can imagine there is a “But”. You must use your PC to program the remote. Actually I see this as a plus. I found the program fairly easy to negotiate. With installed programing, it walks you through the various components to perform the set ups… Yes, it will take the better part of a day to complete this function, but it is TOTALLY worth it. With Logitech library of remotes, the program remains updated so, if you buy a new DVD in 2 years, they will probably have the code set , so all you have to do is upload the new instructions. I have to admit, this part of “Cutting the Cable” caught me off guard. I did not figure this into the equation. However, if you look at my original formulas (Part I) on cost and budget, we had some room to make some adjustments. The Harmony One has been out a couple of years, so the price has dropped from its original price of approximately $239 to about $165. The model 900 is fairly new, so they are still pricy ($349). Granted if your equipment is concealed you will need either the RF version remote or an IR Repeater (Channel Vision or Smarthome both have decent solution for under $100). If your equipment is in a remote closet, the RF version will keep you from having to run wires from the TV to the remote location and there is no receptor located at the TV. For me, I had already wired for IR, so it worked out better for me to use the IR. I am approaching to final step, so stay tuned to see if we can make the final cut. You are currently browsing the archives for the Structured wiring category.